Our mobile website allows you to access account information and make transactions from your phone's web browser. 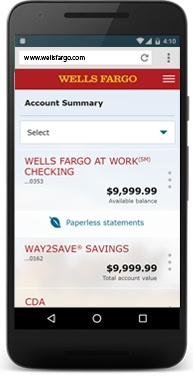 Optimized for use on your smartphone, it provides fast and easy access to your accounts, and there are no separate Wells Fargo fees (your mobile carrier’s text messaging and web access charges may apply). Visit wellsfargo.com on your mobile phone's browser and sign on with your Wells Fargo Online® username and password.